While it is very exciting waiting to welcome your new pet home, it can sometimes be a little daunting, especially if they are your first. We have put together a few handy tips to make their arrival as smooth as possible for both you and your new furry friend. Puppy/ kitten-proof the house - Ensure any dangerous objects are well out of reach or tidied away. Remember kittens like to climb – so a work surface may not be ‘out of reach’ for long! Toys - It’s inevitable when you know there is a new puppy or kitten on the horizon to want to go out and buy them toys – and by all means do! As with any dog or cat toy – it’s best to supervise them playing at first, to ensure they are not pulling it apart and eating any of the pieces. Buy toys which are appropriate for their size and age, for example, if you are buying chew toys, then it may be best to go for puppy versions at first so they do not damage their teeth chomping on them. Food – Find out what the breeder is feeding them and ensure you have the same food to give them when they first get home. There is a huge amount of change going on at this point in their lives – moving away from mum and their siblings and into a new unfamiliar environment. We don’t want to be adding a change in diet to the mix at this point. Even if you are keen to change their food, give them a little time to settle in prior to starting this gradual transition. Insurance – Get them insured with pet insurance from a reputable provider. It’s best to get them covered immediately from when you plan to bring them home. An unexpected accident or illness can require sudden treatment and vet bills can accumulate quickly – having a good insurance cover can help provide some peace of mind that they will be able to receive whatever treatment they may need. Your vet may be able to help provide further advice on this topic. It is sensible to always read the small print of an insurance policy. It is a good idea to get a life-long cover, to avoid certain conditions being excluded after 1 year. Vet - Get them registered with your local vets and booked in for a check-up soon after they have joined you. Vaccinations – If they have not yet had any vaccinations, then these can likely be started at their first vet check-up in line with your vet’s protocol. Some breeders will elect to give the first vaccination – it may be worth checking that the brand used by the breeder is compatible with that used by your vets so that there is no delay getting them out an about exploring the world. Bring home something which smells of mum - Where possible, it can be soothing for your little one to bring them home with something which has their mother and littermates’ smell on it. A blanket, towel or t-shirt are all ideal. The item can be put in their new bed when you get them home, to help it feel a little familiar for them, and to comfort them after leaving their mum and siblings. Litter Tray – You’ll want to keep your kitten inside when you first bring them home, and ideally until they are neutered. Ensure they have easy access to a litter tray, and that it is placed somewhere quiet, away from their food and water bowls. If the kitten is joining other cats in the household there should be 1 litter tray per cat plus 1 extra. No escape routes – Kittens can be little explorers, so be careful to shut doors/ windows to rooms which they are left in, to avoid them getting out into the garden before you intend them to do so! Microchip - Get them microchipped before going outside. While we hope it will never be needed, in the unfortunate circumstance that they were to go missing, this will mean they can be traced back to you. Toys – get some cat specific toys. A scratching post may be a good idea, to try and minimise damage to your house and furniture. Garden - Ensure the garden is puppy proofed. Puppies had a surprising ability to search out the smallest hole and squeeze themselves through it. Prior to bringing your pup home, go round the garden carefully and ensure there are no accessible escape routes. Crate training – is very popular with puppies. It provides them with somewhere safe, and which is their space only. Using a crate also means you know that they are safely shut away overnight/ if you pop out for a short time, and need not constantly worry that they may be up to mischief which could harm them. Obviously, it is important that they have plenty of access to water, and are not shut in the crate for long periods of time. It could be worth contacting your local dog trainer for further advice on this topic. Dog training – Search out a local dog trainer and get yourself and your new puppy booked into puppy classes once they are old enough/ have had the appropriate vaccinations. It’s great to get them socialising and learning while they are still young. Plan your training - Get fellow housemates on board with any training strategies you want to use from the word go, for example, reward words, toilet commands, how you want to stop jumping up etc. Minimise chewing potential - Every puppy will be different, but it could be worth preparing for the fact that you may end up with a ‘chewer’! Find a place to hide your shoes out of the way for the first few months and consider using a ‘no-chew’ spray, such as bitter apple spray on the accessible/ chewable parts of furniture. Many of these habits can be limited/ avoided if they never get the opportunity to carry them out when they are young. We hope our top tips can help you and your new arrival settle in as smooth as possible and follow us as we delve into how to introduce your new puppy or kitten to existing pets in the coming weeks! Gemma qualified from the University of Cambridge in 2013. She is passionate about evidence based medicine and is particularly interested in the role that the microbiota can play in so many diseases. 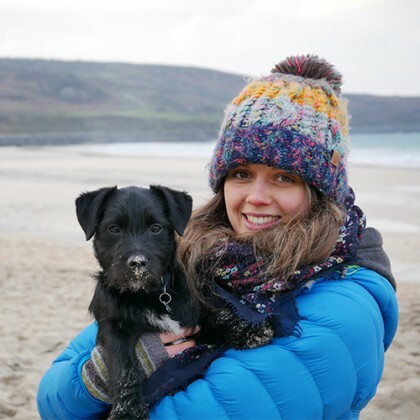 In her free time Gemma loves climbing hills and finding beaches with her terrier, Percy, and hanging out with George the cat!